Slipstream’s sacking of Matt White, and their allegations against Trent Lowe, raise questions about the team’s priorities. Back in November 2007, I attended the Slipstream team camp in Boulder, Colorado. It was the team’s first get-together as a top-level cycling outfit, having grown from a development squad into a team with ambitions to ride the Tour de France. The atmosphere was one of optimism. Slipstream manager Jonathan Vaughters had promised that the team would be built on a foundation of ethical, clean principles, and transparency. The riders bought into it, the press bought into it (me included), and judging by the team’s reception at the presentation at the Boulder Theater, the public bought into it as well. And it looked like Vaughters was living up to his word. At the Tour de France in 2008, he invited Sunday Times journalist Paul Kimmage to be embedded with the team. Kimmage’s series of eyewitness accounts and interviews throughout that Tour were some of the finest articles on the sport I’ve ever read. Garmin, as they were by that point, were open, transparent, clean and successful. But something has changed. 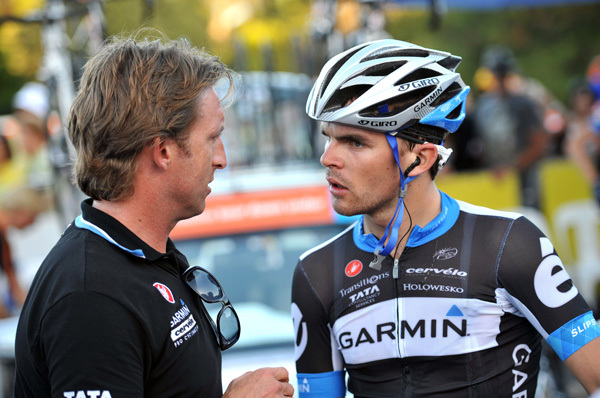 Garmin-Cervélo (Slipstream’s trade-team name) is currently involved in a furore about their abrupt sacking of Matt White as team manager at the end of the Tour Down Under. White had referred Trent Lowe, a former Slipstream rider, to the Sports Institute of Valencia, which is run by Dr Luis Garcia Del Moral, in April 2009. Del Moral has been at the centre of several allegations of malpractice in sport, and according to the strict anti-doping policies at Slipstream, referring Lowe to him was an offence deemed worthy of instant dismissal. Del Moral was the individual filmed by French journalists disposing of US Postal medical waste at the 2000 Tour, some distance from the race, in spite of the fact that the Tour organisation provides medical waste disposal services for teams. The team then issued a press release last night that poured oil over the flames of controversy in which they admitted that Lowe had been to see Del Moral to conduct blood tests for the UCI’s quarterly health check (not an anti-doping check), and that Vaughters and team doctor Prentice Steffen had been copied in on the email containing the results. Del Moral’s name was on the document, but the release stated that neither Vaughters nor Steffen noticed the doctor’s name. Finally, they made a serious allegation against Lowe, and his advisor Martin Hardie, that they were planning to go public with details of the email unless they received 500,000 euros. Lowe and Hardie have so far been unavailable for comment on these allegations [see update below]. The matter is further complicated by the fact that White had been linked to the formation of the GreenEdge cycling team in Australia (a team which Vaughters threatened with legal action if they approached his riders before the transfer window opened on August 1st). And Lowe was not paid his December wages by Garmin after he was pictured at a Pegasus team get-together, with a Scott bike. Pegasus then fell apart, leaving him without a team for 2011. In summary, it looks like Slipstream have acted fast and decisively to uphold their strict anti-doping rules, and also in reaction to an alleged blackmail attempt by an embittered ex-rider. Vaughters has been praised for his actions by both fans and journalists. Like I said, something has changed. To me, it looks like the anti-doping policy took second place to maintaining team morale at the Tour Down Under, which Garmin-Cervélo rider Cameron Meyer did win. Vaughters told Cycling Weekly that he had waited “two weeks, or 10 days” to take action against White. “I felt it was a decision that should not be taken while they are racing every day,” he said. You what? Winning the Tour Down Under and keeping the riders happy took precedence over a team manager referring a rider to a doctor with the reputation of Del Moral? If it was an instant, sackable offence, then the sacking had to take place immediately. What’s the point of firing somebody and escorting them from the building two weeks later? Garmin’s problem is that they are no longer the transparent organisation that they were. Maybe they grew too big, maybe it was too difficult to maintain, it doesn’t matter. In this affair, they have managed the release of information and delayed a crucial decision, and this undermines the whole commitment to transparency. The foundation of their team was ethics. But the delay of White’s sacking made it clear that the foundation is now getting results. I don’t doubt the commitment of many in the team to ethical cycling, but in this case, ethics took second place to results and team morale. It’s also extremely surprising that Vaughters didn’t notice the name of Del Moral on the pdf that he was sent by Lowe. Vaughters knew Del Moral from his own time at US Postal – I would have thought the name jumped off the page at him. If the rules are so strict about who riders can be referred to, then are Vaughters and Steffen guilty of incompetence in not checking and enforcing, or worse, might they have found out before January 6th? Either way, the reality has not lived up to the PR, and that is a serious matter. Lowe’s alleged blackmail is also a serious matter. Garmin have issued an extremely defamatory allegation against him. But why would Lowe deem the correspondence about routine blood tests, which have been downplayed by Garmin themselves, worthy of half a million euros? – How many times, for any reason, did Trent Lowe go to Del Moral? – Why did Matt White send Lowe to Del Moral? He can’t have been ignorant of his reputation. – Did White seek a compromise in which he could keep his job? The sacking appears to have been remarkably bloodless and accepted by both sides. – Was your hand forced by anybody outside the team in sacking White? – Why did keeping the riders happy at the Tour Down Under take precedence over such a serious matter? – In delaying the sacking so that the information could be released in a managed way, do you feel that transparency has been compromised? – How did you miss the name Del Moral on the pdf sent by Lowe in June 2009? By not noticing it, do you share responsibility? – Can you immediately produce a copy of the pdf, so that people can see for themselves how easy Del Moral’s name was to overlook? – What was your relationship with Dr Del Moral when you were at US Postal? Did he have any hands-on involvement with your programme? – Have any other riders been to see Del Moral? If Lowe was able to go, and nobody found out about it, how sure can you be that the team isn’t compromised in other ways? – If the health check test was such a small matter, how could Lowe feel it worthy of allegedly asking for half a million euros?